London, Asharq Al-Awsat—Want to fight Israel’s illegal occupation of Palestinian territory? 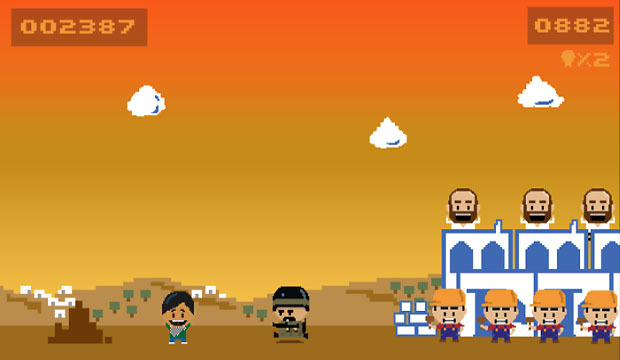 Pretty soon, you’ll be able to do just that in Ramzi’s Rumble, a forthcoming Indie game that puts the player in the shoes of a young Palestinian who has to defend his land from illegal settlers. Throwing stones at construction workers and jumping over charging soldiers, young Ramzi tries to do everything in his power to stop illegal settlement building. Ramzi’s Rumble, created by London-based game developers Paolo Carvajal and Vinay Chaudhri, passed its Kickstarter goal just one day after the Palestinians’ submitted a historic draft resolution to the UN Security Council setting a 2017 deadline for the end of Israel occupation. “Like most people in the world, and like most of the members of the UN, we support an independent Palestinian state. The people of Palestine deserve the recognition and protection of the international community. The sooner the better,” game designer Paulo Carvajal told Asharq Al-Awsat. “We haven’t discussed how a potential recognition [of the state of Palestine] will affect the game. We just hope that the Palestinian people get what they deserve and what was promised to them by the international community decades ago,” he added. Carvajal said that one of the main reasons for deciding to develop a game featuring an Arab protagonist was due to frustration over the lack of positive Arab or Muslim characters in Western media, particularly games and movies. “We were basically fed up with the stereotype of the Arab as a terrorist and wanted to create an Arab hero. Someone young Arab kids could aspire to. But also to present Westerners with the unknown concept of an ‘Arab hero’. We notice it makes them very uncomfortable if Arabs are not being portrayed as villains or victims,” he said. However Ramzi’s Rumble is just the first step in a “master plan” by Chaudhri and Carvajal, not just to help raise awareness of the Palestinian cause and Israel’s illegal occupation of Palestinian territory, but to grow it into an online platform that can raise funds structurally for the Palestinians.